For all the USC fans out there, let me try to explain the general sense of elation surrounding the harsh sanctions handed down to the Trojans by the NCAA yesterday. This guy has it all - smokin' hot trophy wife, mansion with the in-home theater and studio seating, private jet, New Belgium beers and Boylan on tap in the boom-boom room, Navajo art collection. You name it, he has it. You'd never admit it, but, yeah, you're jealous. In fact, "envious" is an understatement. Then you find out this dude is cheating on his taxes. Not like "forgetting" to report that $230 you won at Foxwoods. I'm talking cheating that would put Tiger Woods and Jesse James to shame. Now, if there's one thing you can't stand, it's paying taxes. You don't understand what you're paying for. You don't understand why you're paying them. You don't how they're calculated. All you do know is that there's that whatever percentage out of your paycheck that goes to the man. And this guy is living it up while running circles around the IRS. Then you wake up one morning to see Leisure Suit Larry from 'round the way splashed all over the front page, heading to the joint for tax evasion. He finally got what was coming to him. Best news you've seen in years. Is it petty on your part? Hell yes, and it's awfully ugly. But all that schadenfreude doesn't change the fact that your neighbor did the crime. And when you let some flout the law, the people who follow the rules feel like chumps. "How is this the school's fault?" "What Alabama did was worse." "The NCAA and the media are out to get us." "People are just jealous of our success." Whatever. All that dissembling makes for a nice distraction from the truth that your school screwed up. Badly. To quote Jimmy McNulty, "You play in the dirt, you get dirty." And when you're the king of college football, you know that the haters are digging even harder. 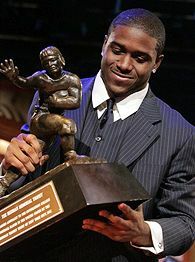 Reggie Bush and his family didn't just hand them a shovel. He gave them an excavator. Justice may not be the reason behind the celebrating, but that doesn't mean justice wasn't served.